In Part 1, I provided an overview of the judicial farce that is Maryland, at least the speed limit enforcement portion thereof. You should probably read that post first if this one is to make any sense to you. At the end of that post, I've added a link which will bring you right back here. I'll wait why you catch up. Welcome back. As I promised, I'm going to give you my assessment of why the fiendish automated speed enforcer is putting its icy grip on our innocent citizenry. To better understand the workings of Optotraffic's DLS-10S Automated Speed Enforcer, I reviewed their patent. It is number 7616293, "System and Method for Traffic Monitoring, Speed Determination, Traffic Light Violation, Detection and Recording." (You can read any patent for free using Google Patents. It's even easy to remember the URL: www.google.com/patents.) You can read the 38 page patent yourself if you wish, or you can trust me. Perhaps you should read it yourself. I'll wait. Sure. Like you read it. So let's take a look at it. Here's the top. Click to enlarge. You can see the patent number and issue date at the upper right. 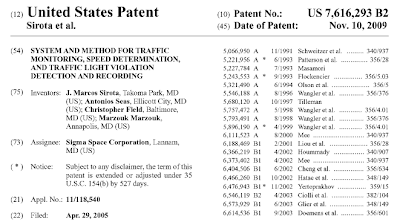 At the lower left, you can see that the patent was filed on April 29, 2005. This is interesting. 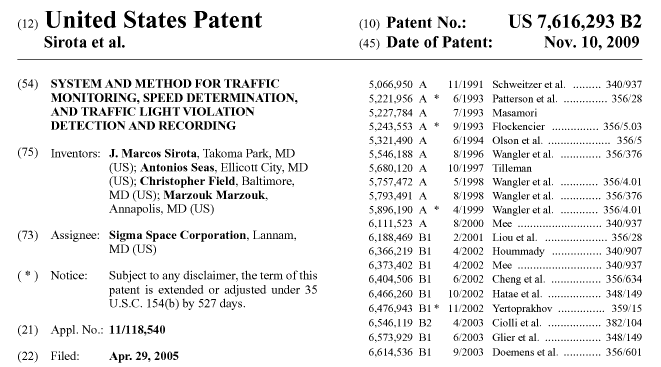 I don't see the name Optotraffic anywhere in the image or anywhere in the patent. Instead I see the patent is assigned to Sigma Space Corporation of Maryland. Let's check their web site and see what they have to say for themselves. Our customers include NASA, NOAA, DoE, DoD, universities, and commercial customers in the aerospace industry. Our mission is to provide tailored and innovative science and technology solutions and products that further the success and goals of our customers. Look at that! The Department of Defense is one of their customers. Given that, I suggest they be careful labeling their paperwork as CONFIDENTIAL unless it really is Confidential from a defense standpoint. You're not supposed to be slapping that on paperwork that's not actually Confidential. It causes people to treat it as if it's meaningless. I see also that the folks at Sigma Space Systems are customer oriented. They want to provide "products that further the success and goals" of their customers. If, for example, your city has a goal of generating 38% of its revenue via speed traps and bogus speeding tickets, you should contact Sigma Space Corporation. If, however, you simply want to reduce traffic accidents, then I'm afraid Sigma Space Systems has nothing to offer. It seems automated speed cameras have not reduced traffic accidents. Optotraffic is a division of Sigma Space Corporation, a leading provider of instrumentation systems to the aerospace industry. Founded in 1998, Sigma provides LIDAR and other space-related instrumentation to NASA and other government agencies. Optotraffic uses space-proven LIDAR technology to provide clients with highly-accurate, low cost traffic monitoring and enforcement solutions. Here's the process. You send your tax dollars to Washington. They keep some for themselves and send some to Sigma Space Systems. Sigma develops some cool LIDAR technology, such as tracking volcanic clouds or helping aircraft figure out their altitude to within a centimeter. Sigma then goes all Forbin Project on you. Here's the money shot from the patent. I've cleaned it up a bit to make it easier to follow. Except the sharks would have lasers connected to their eyes. This image from the patent shows the beams more correctly aligned, as parallel. Sigma can presume the distance is equal to the distance between the two laser beams iff (if and only if) the beams are parallel. Doesn't anyone at Sigma read their own patents before submitting them? I know it's just a stupid sketch error, but it makes me wonder if they might have overlooked something else, something that might cause them to record the speed as 76 mph when it's only 35. Look again at the three-image sketch, the one where the car is in three different positions as it passes beneath the lasers (which should be parallel for Pete's sakes). In the first of the three images, the two laser beams are both bouncing off the road. In the second of the three images, beam 1 is bouncing off the car and beam 2 is still bouncing off the road. That causes the system to start counting its laser pulses. In the third image, both beams are bouncing off the car. That causes the system to stop counting its laser pulses. Now it knows both time and distance. 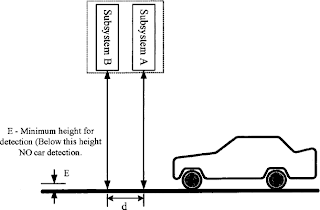 The distance traveled by the car is equal to the distance between the beams (if the beams are parallel), and the time it took the car to travel that distance is equal to the number of laser pulses times 0.0001 seconds. Two tenths of one percent of 35 miles per hour is only 0.07 miles per hour. It's similar to the sluggish beams issue. If the beams are not nice and crisp, if they spread out on their way to and from their target, then the car could be anywhere inside a big laser blob. Fuzzy beams introduce distance errors, just as sluggish beams introduce distance errors. The thing here is that Sigma Space Systems is really, really good at getting really, really crisp laser beams to fire really, really close together. It's what they do. If their laser beams are narrower than 0.2 mm (the largest number conceded in their patent), then the fuzzy beam distance error is 0.2 mm, aka 0.00656 feet. That's pretty close to the sluggish laser distance error of 0.00513 feet. Together, the two phenomenon could lead to an error of 0.16 miles per hour at 35 mph. Because Sigma fires their beams so rapidly and so crisply, this sort of distance error is itsy bitsy, teeny weeny, and they know it. That's why they discuss it in their patent, though they exclude other possible errors. That's why they rely on it when advertising their product, and when showing calibration charts for any particular machine. This one is easy. The cameras are on top of a big bendy pole. If the wind is blowing the cameras toward you at 12 mph, and you're going the speed limit, you're going to get a ticket for speeding..
Do the cameras bend in the wind? You betcha. I quote from an email I got from Will Foreman himself. The Today Show visited our store yesterday. They spent about 3.5 hours with us. It was great! The best part was watching them film the telescopic tower sway when there was a breeze, or when a heavy truck or bus passed by. That's great. The fine folks at Sigma Space Systems blow laser pulse calculations up your backside but forget to consider the wind. You can search their brochure and their patent until you are blue in the face, but you are not going to find the letters w, i, n, and d joined together. I think the guy who couldn't draw parallel beams might have been the same guy who coordinated their fault tree analysis. What a bunch of buffoons! The wind can move the cameras in really complex fashion. The lasers can move parallel or perpendicular to the road. They can rotate as the pole twists at its natural frequency. Since Sigma claims it can accurately detect movement with its lasers, I suggest they place two fixed targets at the base of their DLS-10S Automated Speed Enforcer and fire two lasers downward. If wind is not a problem, the lasers will always be able to reflect off the targets. If the platform stability lasers are not able to stay on target, then they should throw the whole thing into the next trash truck to (allegedly) speed by. ... the 32' pole the sensors are mounted on could sway or vibrate, possibly due to wind or a large passing vehicle, causing the beams to move while the vehicle is passing them. As I just noted, I think this one is smack on. With regard to another speculation, however, I think he whiffed. ... the device might not work correctly during times of high load. It might take a short amount of extra time to take the second measurement, amplifying the speed measurement. Delaying the second measurement would actually decrease the measured speed, but that is incidental. The point is that firing crisp pulses rapidly in succession is what Sigma is really, really, really good at. 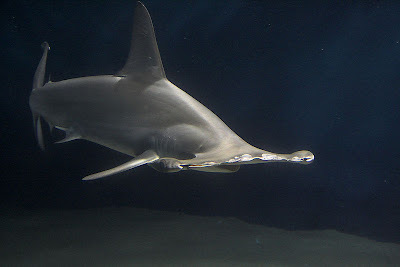 They may not be able to draw parallel lines, and it may not occur to them that they have a bendy pole, but they can fire lasers with the best of 'em. I think Ron also missed the mark with a variable vehicle speculation, though not by as wide a margin. ... many of the vehicles showing these errors are trucks, pickups, or buses. These vehicles have a very different "profile" than a passenger car. If the device was never tested on vehicles with different profiles they might not be able to handle the case correctly. As long as the two beams read the same point on the vehicle, it doesn't matter what point the beams read. The DLS-10S is actually designed to track both the front of the vehicle as it enters the kill zone AND the back of the vehicle as it leaves. Again from the patent, I show a three image sketch. In this image, Sigma is showing how its system can calculate the car's speed by monitoring when the car left the system's field of view. The math and the demands on the system are essentially unchanged from the case where the car is entering the field of view. If every car had a laser reflector on its roof, then the system could use that as well. (Don't tell the feds.) It makes no difference where the lasers look as long as they both look at the same place. It makes no difference how the car is shaped as long as the lasers each detect the same point on the car, or truck, or bus, or mule team. There is an interesting point here, I hope. Sigma claims in its patent that their system can determine the deceleration of the car, as well as its average speed, as it passes through the field of view. This will allow them to catch those scofflaws who hit the brakes once they see the cameras. I'm sure Sigma is right about that, assuming each speed is measured accurately. If they know the car's speed on entry and the car's speed on exit, they can calculate both an average speed and a deceleration. Even I could do that. But the fine folks at Sigma don't really want you to know about that capability. Their current defense is that Will Smith's car (and all the others) might be going 35 mph in the photos, but they were going 76 mph when they passed beneath the lasers. Sigma just says that. They don't show you the entry and exit speeds and allow you to calculate the deceleration yourself. They just claim you were braking, so there. Now you might say: "Look at the pictures. My brake lights aren't on." But they will say "You must have released the brake just before the photos were snapped." Then you say "but no car can decelerate that fast." And they say "You can't read the photos that accurately because of perspective. Our cameras, on the other hand, are calibrated against GPS satellites. Our speeds are accurate to within a small fraction of 1 mph, and you have to be going more than 12 mph above the speed limit before we can give you a ticket. Did I mention we are calibrated against GPS satellites?" And then you say "but your patent explains that your system can calculate acceleration by looking at the change in the car speed as it enters and leaves the field of view. Why don't you show us that?" And then they say ... "That's confidential and proprietary." I'm confident Sigma fears showing both entry speeds and exit speeds. It would open up a gigantic can of rather large worms. Showing the times on the photos, for example, has already caused them big headaches. Will and StopBigGovernment MD and all the others are using those times to show the Optotraffic DLS-10S Automated Speed Enforcer is full of crap. I guarantee you the speed camera manufacturers (not just Sigma) will try to stop displaying the times on the photos long before they ever start showing the both the entry and exit speeds. Oops, looks like I'm right already. Here the speeds are seemingly being rounded to whole seconds, making photographic speed assessments much more difficult. Sigma and the other speed camera manufacturers need to suppress the evidence, not highlight it. Let's consider Ron's fourth speculation. ... the two beams could simply strike different parts of the vehicle, for a variety of reasons. I think this is possible. I find two system "features" in the patent that might be relevant. I discuss here admission that sensors don't know exactly where the road surface is. They only know where the road surface is within some error range they call E. I'm going to repeat a sketch to remind you of that. See. In the lower left is the uncertainty E, and a note. "Below this height NO car detection." What I can't see is how E is set in the system, or adjusted, or calibrated, or forced to be the same between any two cameras. I see nothing to tell me how large or how small E might be. E is a mystery variable. Let's just say that one laser is more near-sighted than the other. It has a bigger E. It is more likely to interpret something above the road as road rather than car. In fact let's say that the laser is so near-sighted that it sees a bumper and still thinks it's looking at the road, because it uses a big E.
By the time the near-sighted laser recognizes your car, your bumper is already part way to the second laser. If you bumper is 6 inches deep, it is only 24 inches from the next laser, assuming the two lasers are 30 inches apart. This will cause an overcalculation of your speed by a ratio of 30 to 24, aka by 125%. If you are traveling 38 in a 35 zone, plan on getting a ticket for traveling 47. It gets worse rapidly if the lasers are closer together. If they are only 1 foot apart, than even a 4 inch bumper could lead to an error ratio of 12 to 8, aka 150%. If you are traveling the speed limit, plan on getting a ticket for 52 mph! This one really surprised me. It's a second reason why the beams may detect different points on a car. It's not because one laser is more near-sighted than the other; it's because one has poor depth perception compared to the other. As it turns out, the lasers don't detect just on distance, as one might expect of a laser ranging system. Instead, ... well, heck .. I'll just let the patent speak for itself. Using the recorded delay in conjunction with the signal strength, the presence/absence of a vehicle can be determined. ... A change in the signal strength is defined as either an increase or decrease of the recorded voltage. In most cases, the change corresponds to a decrease of the signal strength due to slight misalignment of the optical sensors. 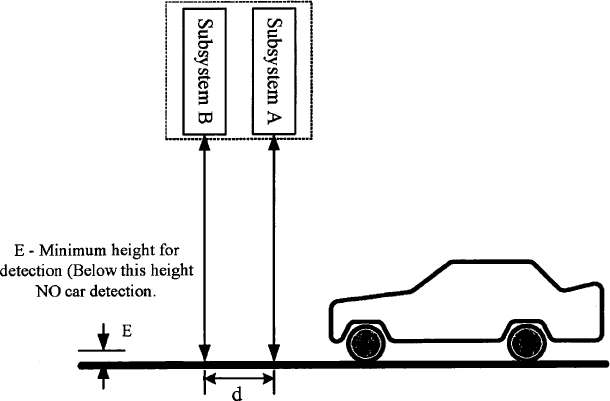 There are however exceptional cases where an increase of the signal's strength can be observed due to high reflectivity of a car's surface aided by reflecting / scattering alignment conditions. ... If the recorded signal strength is different from the expected value, and/or the time delay is smaller than the one corresponding to the road surface, then trigger the timer to start .. or stop. Holy fatal flaw, Batman! In most cases of a signal strength change, it is merely because of a "slight misalignment of the optical sensors." But sometimes, on rare occasion, the signal strength change might indicate the presence or absence of a car. In all cases, however, we will use the signal strength change to imply the presence or absence of a car. The laser ranging system clearly has a depth perception problem. That's why they augment it with variable power detection. Sometimes the system will rely on how bright something is rather than how far away it is. If you put such a system in a darkened cave and shined two lights at it from random distances, it would always think the 100 watt bulb was closer than the 60 watt bulb, because the detection system was made stupid by the new variable-signal-strength feature. If the DLS-10S could depend on just its laser ranging capability, then it would. There would be no need to complicate everything with some sort of unproven "I have seen the light" system. Conversely, if the signal strength system was entirely dependable, there would be no need to augment it with the laser ranging system. The fact that they are using both methods tells me that they are not completely confident in either. It's not that a laser system can't detect a variable signal strength, it's that it will be very difficult for them to detect within the same tolerance. One might trigger where the car is slightly reflective and the other might not. One might detect the car because the beam got brighter, and the other because the beam took longer to return. In that case, they would be looking at different parts of the car. As we have seen already, that's bad. You've been extremely patient, so this will be the last possible error that I discuss, and I will make it quick. 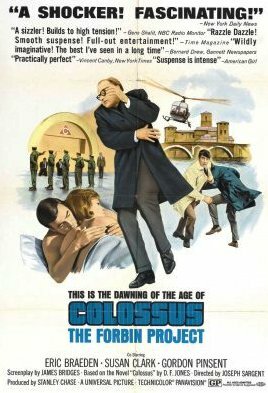 I cautioned in Part I of the series that you should never cross the beams, that bad things would happen. Let's put some numbers to that claim. Let's assume the lasers are 24 inches apart from one another and 35 feet from the target zone. Let's assume also that the lasers are misaligned such that the beams converge at an angle of 1 degree. Let me do some back of the envelope trigonometry, and I'll be right back with you. Okay, I'm done. Over a distance of 35 feet, the converging beams would narrow the actual target distance by 7.3 inches, from 24 inches to 16.67 inches. That would cause the calculated speed to be overstated by a factor of 24 over 16.67, aka 1.44. If you were traveling 35 in a 35 zone, you would get a ticket for traveling 50 miles per hour. I'm sure if you went to court and told the judge "I think the beams may have crossed," he would find in your favor. So, is it possible the lasers could be misaligned by a degree. Well, let's read the brochure. Each lane sensor is third party calibrated annually (by Maryland law) to verify the beam distance. There you go. If the beam distance (the actual spread at the target) needs checking, there must be some fashion to adjust the beams. You wouldn't design a system that couldn't be adjusted unless you were absolutely positive it would always pass the verification check; otherwise you would have to throw the thing in the trash. Any thing that can be adjusted can be misadjusted. Sigma knows their beams can be misaligned. They said so, in their patent. I just quoted it to you. Here it is again. In most cases, the change corresponds to a decrease of the signal strength due to slight misalignment of the optical sensors. So where's the yearly calibration for these things? Is that information available to the public? If the beams are found to have been converging, will all the speeds be re-calculated and fines refunded as appropriate? Here's what I think. I suspect people are getting lots of tickets they don't deserve because automated speed systems in general, and Optotraffic's system in particular, suffer from crossed-eyes and/or bendy pole syndrome. The "bendy poles" explanation in particular hits the nail on the head. That's exactly what's happening with this camera set up. It's a scandal what's going on in MD with these cameras.